– Part 1: Event Expo and Coast to Coast Overview & “Signs” Video. 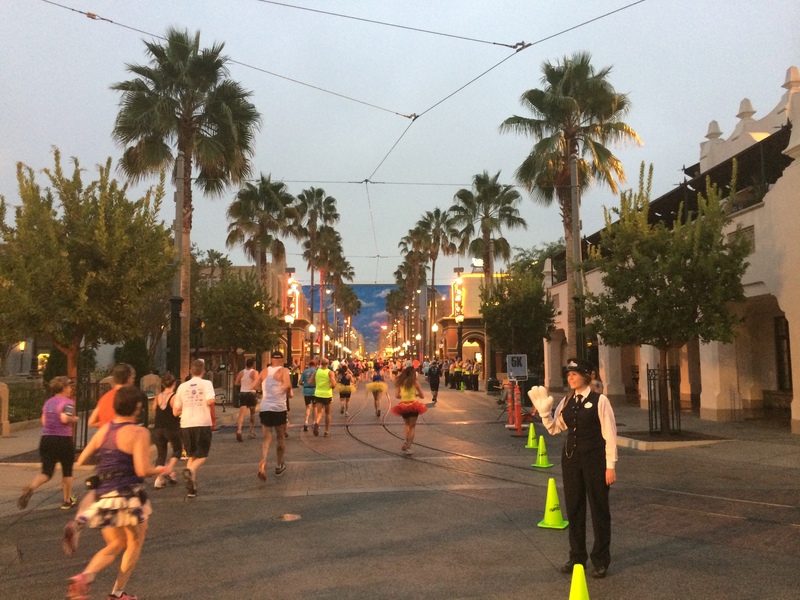 – Part 2: Stitch’s 10k race review &amp; all along the course video. 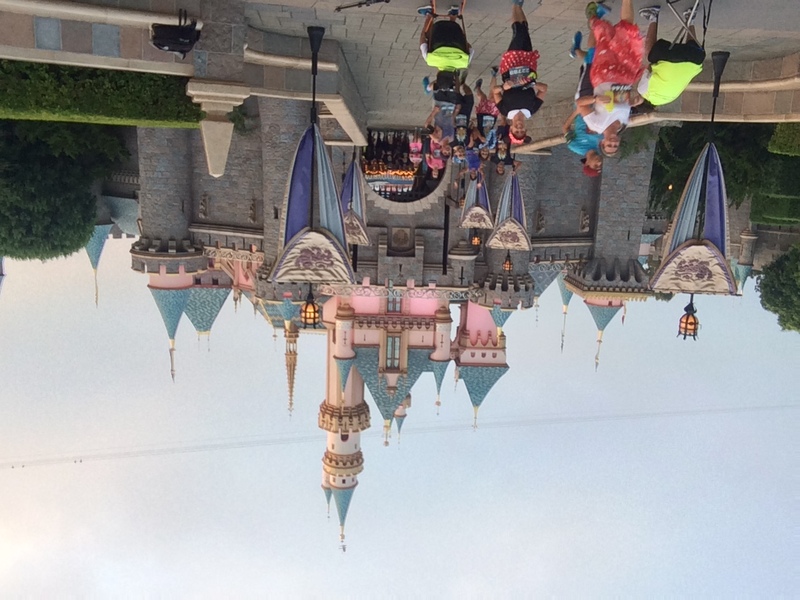 – Part 3: Disneyland Half Marathon race review &amp; all along the course video. Truth be told, there is no way that I would fly all the way to California to run a 10k. In fact, the only reason that I ran this race was because it was a part of the Dumbo Double Dare Challenge with the Half Marathon event. That being said, running this event was an absolute thrill and I am glad that I did. For the review of the race expo and the swag, check out Part 1 here. I should also note that this was my first race challenge and would be the first time that I would be running back-to-back races in consecutive days. I had trained for this and felt prepared, but I also decided to skip my usual shakeout run because I had no intention of taking the 10k out too hard, instead I would be taking lots of opportunities to stop and take pictures and video. Thus, I felt confident using the 10k race as a pseudo shakeout run for the next day’s half marathon. It seems as though every time I enter a runDisney event, the costumes are more and more impressive and entertaining. That being said, I am pretty boring and just stick to “normal” running attire. For this event I assembled a kit consisting of a SweatVac race hat, Adidas Climalite compression shorts, Reebok tank top, Hind running shorts, C9 wristbands, and Saucony natural series running shoes. I also grabbed my Yurbud triathlon series headphones and my IPhone 5S. However, I did make two mistakes. First, even though I would be finished before the sun rose too high, for some reason (I wasn’t thinking) I grabbed a pair of sunglasses, and was forced to carry them for the entire race, which was annoying. Second, I completely forgot to make a race music playlist, so I just grabbed one for an old race, which worked out just fine, but was not quite the same as having a tailored list. Oh well, you cannot win them all. 10k runners get their kicks on Route 66 in Carsland. My hotel provided breakfast daily, but since the race started at 5:30am, I would not be able to grab any food before the race. I had planned ahead and grabbed a few extra items the previous day to put in my hotel fridge, but I had to be adaptable on my pre-race meal. I had 2 doughnuts (so yummy, I cannot remember the last time I had a doughnut), a bowl of dry Fruit Loops, iced coffee, and a 24 ounce water. This was probably more calories than I would need for a 10k, but hey, I was on vacation! Before leaving my hotel, I also packed – or so I thought – clothes to go straight to the parks in my gear check bag, which was a little heavy because I included a large water bottle in it (I would recommend against doing this as the weight got annoying and the draw strings for carrying the bag dig into your shoulder). The best part about Disneyland runDisney events, as opposed to their Walt Disney World counterparts, is that everything is so close together. My hotel was at the corner of Harbor and Katella, so I was able to walk from the front door of my hotel to the event area in less than 15 minutes (as opposed to having to take event buses and wait in long lines of traffic). Once I got to the Disneyland Hotel, like a lemming, I just followed the crowd. I was disappointed that the runDisney signage was not better, and I was left hoping that I was walking in the right direction for the bag check. I did ask one cast member for directions, but she did not know where anything was located and simply suggested that I follow the crowd and ask someone else. I did find my way and there were no lines for either the bag check or the bathrooms. Since fewer runners were entered in the 10k event than the half marathon, and they share a start/finish area, there was more than ample amount of port-a-potties for everyone. This is a wonderful thing to see at 4:45am! They had the usual dance party and race announcers to keep the runners entertained. 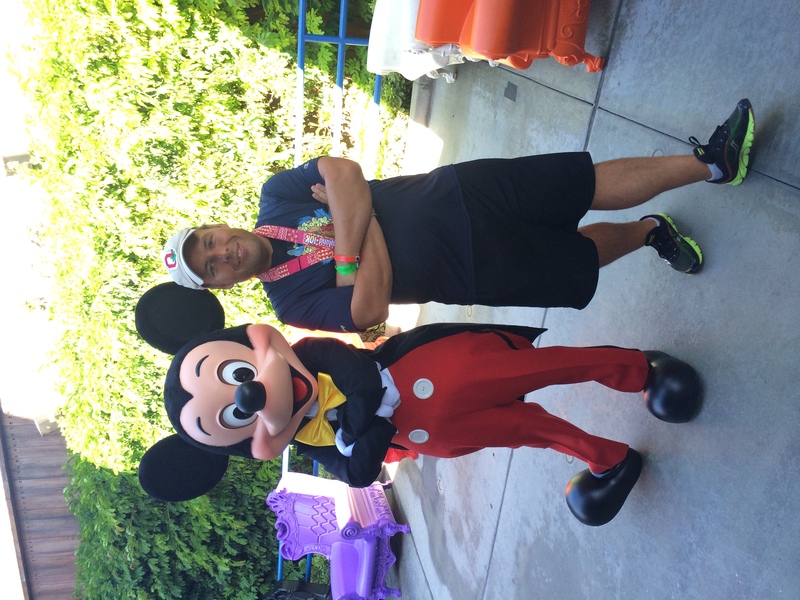 I use the word “usual” because it was standard fare for a runDisney event, but that being said, it is better than any other event I have attended, and it is effective at entertaining the crowd. Cell phone service was surprisingly fine in the starting corrals, and I was able to meet up with my friend David before the race. Unfortunately there were no fireworks for the start, but I assume that this was because Disneyland is much closer to residential areas than Disney World is. But they did use lots of flashing lights to help make the starts special for each and every corral. This course was awesome. Let me say that again: this course was awesome. We started off heading south away from Downtown Disney, and, at least for corral B, the crowd thinned out much faster than any other runDisney race I have run (though I heard from other runners that this was not the case for other corrals). I had one unwelcome experience early on. I was running along the right edge of the road at a good pace for the corral (I was actually passing people), and one runner decided to squeeze into too tight of a space and cut me off to get ahead of me. I stumbled slightly, which caused me to slow down. Just then, I received a rather forceful forearm to the back and was then cut off by the person who did so. Evidently he wanted to keep up with his buddy who had just passed me (and was the one who forced me to slow down). 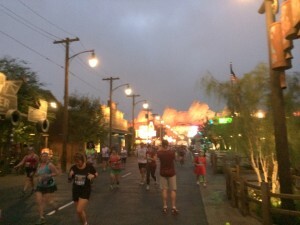 Needless to say, there is no reason for this type of behavior in any race, let alone a runDisney event. The World of Color, 10k race edition is worth the price of entry. Just before the 1 mile mark, we turned left to loop around the Anaheim Convention Center. Two observations about this part of the course. First, they had a bank of port-a-potties with no waiting! This was a nice surprise and I was quickly back on my way. Second, I am not quite sure why, but I really enjoyed this part of the course. The Convention Center has some pretty interesting architecture and lighting effects, which made for a nice route especially at that time of day (I wish they would include this section in the half marathon course). Plus the course had some gradual curves at this point, which was a nice change from straight paths. We reached Harbor Boulevard and turned left (north) to make our way back to Disney property, and that is where the crowds started to pick up. We turned left into the back stage areas of California Adventure, which is where the course designer started to really earn his paycheck. Event organizers did a stellar job of maximizing our time in the parks, and the backstage areas they chose to run us through were awesome. We entered into Carsland and strolled down Route 66 with the Cadillac range fully aglow in the early morning light and neon. Race Icon. A quick left turn and we soon found ourselves approaching the highlight of the course: World of Color. 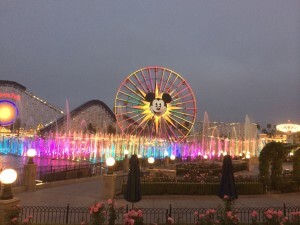 If you have never been to California Adventure, World of Color is a phenomenal nighttime spectacular that employs dancing water fountains, music, and lighting effects on a scale that you have never seen before. For the races, they had the fountains turned on and dancing for us. But that was not enough for the course designers, as they had us completely circumnavigate the lake, so we had the opportunity to take in World of Color for a significant amount of time and to see it from all angles. It was impressive and is one of the great race experiences out there. Runners pass a friendly Disney cast member, just one of many who enthusiastically cheered the runners along the entire 10k course. We proceeded past more attractions, the Carthay Circle Theater, the Tower of Terror, and then exited into a backstage area (I am not sure why we did not get to go down Buena Vista Street, which was a little bit of a letdown), however, I was excited to see what was next. Most park guests would never know this, but there is an underground tunnel that passes under the Esplanade, connecting the backstage areas of California Adventure and Disneyland. This was a very cool feature to run through. On our way down the hill, I happened to be running with a group of runners who were having a good time. One of the guys had to spit, but errantly spat on the leg of his buddy who was running in front of him. The “victim” laughed and hammed it up, and while running tried pulling down the leg of his basketball shorts to wipe it off, but ended up pulling his shorts down, exposing his underwear. Just then the group of girls behind us started whistling and cat calling. I am glad this happened in a backstage area as it was very un-Disney, but it was also highly amusing. We emerged in the backstage area of Disneyland (in the southeast corner), and then double backed out onto the Esplanade where we were greeted by more cheering fans, and then into “the original.” For a Disney fan (especially one whose “home park” is Disney World), there is no way to adequately express the rich history that is Disneyland. This is the only park that Walt Disney actually walked in, and as a result there is a special feel to it. Entering the turnstiles, proceeding past the floral Mickey and the train station, and under the tunnel, you get a little bit of a chill. You notice the history. Walt was here: Main Street USA, in Disneyland. Next, we emerged from the tunnel into Town Square, and at this point everyone seemed to slow their pace. We did not “run” down Main Street USA, we all kind of took our time and just soaked it all in. Unexpected Magic. As we passed the shops on Main Street, one of my fellow runners simply said “Everyone, Walt was here.” A few other runners responded with a “Here! Here!” It was a nice, simple, and fitting tribute. Just like in Disney World events, we turned right into Tomorrow land and then made our way into Fantasyland. Unexpected Magic. In Tomorrowland I encountered a group of the Third Shift Custodial Team, and these guys rocked. They were scatted in groups around the courses on both days, and these guys brought their game. They were whooping it up and lined up offering “high five lines” to the runners. I dare anyone to run by these guys and not have a smile on your face. Thanks Custodial Team, you were awesome. The course exited behind It’s a Small World and into the backstage area of Disneyland. We emerged by the Roundhouse, which is where the monorails and steam trains “sleep” at night. As a kid who dreamed of growing up to be a monorail pilot, this was very cool. We then snaked around the “secret” backstage areas where various parade units and cast members were scattered throughout. This all added up to a very entertaining experience. Race Icon: Sleeping Beauty’s Castle aglow in the early morning light. We reentered the park in Toontown (I told you, the course designers really did a great job of maximizing our time in the parks), back into Fantasyland and past the carousel. Race Icon. Then it was time to run through Sleeping Beauty’s Castle. I am not sure how I managed to time it this way, but I pretty much had the Castle to myself. So I slowed to a walk and just soaked it all in as I emerged into the Hub. The experience was pretty surreal. At the Hub we turned right into Frontierland where the event host, Stitch, was posing for pictures. We strolled along the Rivers of America past New Orleans Square and the Haunted Mansion (which sadly is closed every year during Half Marathon weekend so they can prepare the Halloween overlay), and then exited into the backstage area in Critter Country. The backstage area was a nice calm period before the big finish. We headed south and emerged onto the Esplanade, where the crowds had grown quite large and loud. One cannot help but feed off of the crowd and I had such a strong kick at this point I felt like I was flying. We snaked through the crowds in Downtown Disney, receiving and returning lots of high fives along the way, and then proceeded to the finisher chute outside of the Disneyland Hotel. Just like that, we were done. Oddly, I did not want it to end. This race was a blast, but way too short! I know, it is only supposed to be a 10k, but it really left me wanting more. In any event, the first 6.2 miles of my 19.3 mile weekend race challenge (the Dumbo Double Dare), was complete, and it was time to enjoy the parks and prepare for the next day. 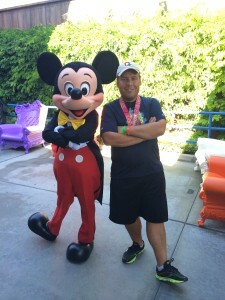 Celebrating my 10k finish with the one and only Mickey Mouse (I am the one on the right). The race medal was nice. It was well-themed with the event host Stitch and the Hawaiian motif. As with all runDisney SMOs, the medal itself is of good quality and it has a very nice, specially-designed ribbon. This 10k medal is nicer than ones I received for running non-runDisney half marathons. So yeah, well done once again runDisney. The post-race area was pretty intuitive to get around and I quickly received my SMO, grabbed plenty of water (I had to start re-hydrating for the next day’s race), took post-race pictures, and then retrieved my checked bag. In contrast to Walt Disney World events, the finish area is so close to Downtown Disney that it is hard to tell where the event area ends and Downtown begins, so it is all one big party with runners and supporters everywhere. This makes for a very cool environment. 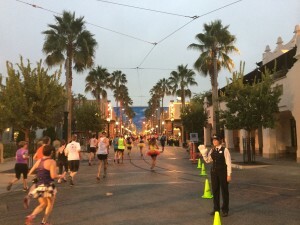 If you are staying off-property, after the 10k, do yourself a favor and walk south to circle below California Adventure. I made the mistake of walking towards the parks/Esplanade and was stuck in a pedestrian traffic jam outside of Katal for 30 minutes (it is Los Angeles, so I guess traffic jams of all types are to be expected!). I just so happened to run into with my friend Tim, so at least we were able to hang out together while we waited for them to let us proceed to the parks. My plan was to change in a bathroom and meet up with my family in Disneyland for the morning, however I realized that in my morning haste I had forgotten to pack some essentials (I foolishly did not pack the night before because I was out way too late watching Fantasmic and Magical, but it was worth it). So I went back to my hotel for a quick shower and to grab breakfast before returning to enjoy the day in the parks. 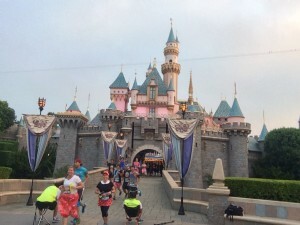 I do not get out to Disneyland very often, so I was determined to enjoy the parks as much as possible. While many people are concerned with not over-doing the parks in order to save their legs for the races, I trusted in my training and did not experience any problems with exhaustion. However, I did make the mistake of going on Grizzly River (a white water rapid ride), which, while it was fun, we got soaked, including my shoes and socks. As I did not have a change of shoes or socks, I had to make due, which was a big mistake as I soon started to develop blisters on both of my pinky toes. This made me very nervous going into the next day’s half marathon. So be careful, when touring the parks, to keep your feet, shoes, and socks dry. Earlier I mentioned the great enthusiasm of the Custodial Team along the race course, but this is not unique to the Custodial Team, as all of the Disney Cast Members showed great pride in these events. I spoke with a Photopass photographer in California Adventure, and he mentioned how he is a part of the team that is developing a program to bring the on-course photos in-house for future events. He was genuinely proud as a cast member to be a part of this endeavor and wanted runners to know that the Disney cast members enjoy having them and want to show their support for them. This is just another example of the ever-present Disney pride and magic. As I said before, I would never have gone all the way to California to run a 10k, but I am so glad that I entered this race as a part of the Dumbo Double Dare Challenge. It was an awesome course and a great race event. World of Color was amazing and the backstage areas were interesting. The only disappointing part of this race is that there were too few character meet and greets on this course. So, if you went in looking for character pics, you probably went away disappointed. But hey, did I mention that World of Color was amazing?!? Would I run this race again? Yes, but only as a part of a race challenge. I like the half marathon event the best of all, so I could not go all the way to California and not run a half marathon, which means I might as well run both, which is not a bad thing. 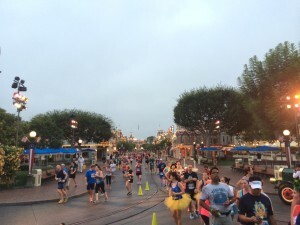 Did you run the Disneyland 10k this year or in a prior year? Do you have thoughts, questions, or experiences to share? If so, leave us a message in the comment section below, or write to us via email, Facebook, or Twitter using the links below. Also, be sure to “like” us on Facebook and follow us on Twitter so you receive alerts of all of the new Casual Runner happenings. Don’t forget, the Dumbo Double Dare is a two race challenge, so you can (and should!) check out my full review of the 2014 Disneyland Half Marathon, complete with pictures and video. Finally, this was a runDisney event so you know I was going to take lots of pictures and videos (I feel like I just said something like that!). In this latest YouTube video, you can experience Stitch’s Disneyland 10k event from my perspective as I take you all along the course, and you get to see some awesome shots of the special World of Color viewing they set up for the runners.